Children are to be respected as unique individuals, different from adults, but not less important or valued as members of the community. The child possesses an unusual sensitivity and intellectual ability to learn from her environment. The focus of activity in our Montessori classroom setting is on the child’s experience within the environment, and not on the teacher’s teaching. 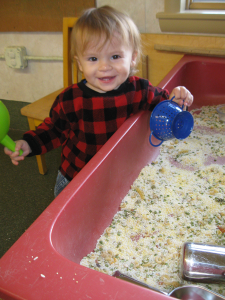 Our environment is designed to meet the needs, interests, and abilities of the children within the class. Teachers adapt the environment through modifying the selection of educational materials available, the physical layout and equipment in the classroom, and shifting the tone of the class to fit the ever-changing needs of the children. Generally students work individually or in small self-selected groups. Community meetings or “circle times” are scheduled so as not to interrupt the child’s work and are usual held at transitional points during the day. There is a conscious effort to design our classroom as a “children’s house”, making it as comfortable and inviting as a home. 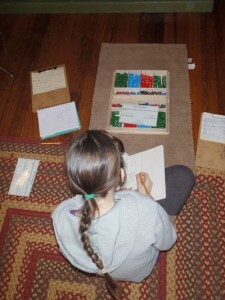 Montessori children learn “at their own pace”. When the child demonstrates readiness, she is guided gently by the teachers in the classroom to explore increasingly challenging activities. In a Montessori setting, teacher’s refrain from comparing students to one another and base evaluations on the progress of the individual. Children are encouraged to work together as well as independently. Often a more experienced child will be asked to assist a less experienced child with an activity or lesson. Group discussion and problem solving are strongly encouraged. Teachers work to create a sense of community within the classroom. Children feel a sense of belonging and responsibility toward their classroom and toward each other. Montessori materials teach through hands on learning, spontaneous engagement, active involvement, and self-directed activity. 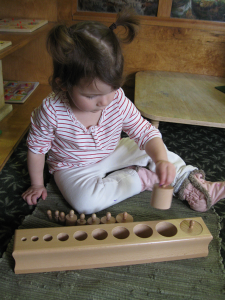 Montessori materials have a control of error inherent in their design. This allows children to work independently, unafraid to make mistakes and to become comfortable with the fact errors are essential to the process of learning. While making independent choices and exploring concepts largely on their own, Montessori students construct their own sense of individual identity. They become independent and confident individuals. The child is intrinsically motivated to learn. In a Montessori classroom children don’t work for grades or external rewards, nor do they complete assignments given to them by their teachers. Children learn because they are interested in things and in gaining an understanding of the world around them. Introduction to a concept. This is usually occurs by means of exploration within the classroom, observing another child at work, a conversation, reading something in a book, etc. Processing the concept. 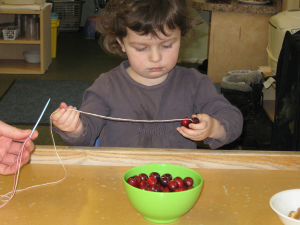 The child develops an understanding of the concept through working with materials that illustrate the ideas, provide opportunity for exploration and experimentation, and provide opportunity for repetition of an activity. Mastering the concept. The child is confidently able to explain the concept and teach the concept to another person. The Montessori curriculum is carefully structured and sequenced based on the developmental needs of each individual child. Teachers maintain careful records of each student’s individual progress. In the elementary and middle school levels teachers use on online record system specifically designed for tracking student progress in Montessori classrooms (and for creating reports to document students’ performance against state standards). Portfolios of work are kept for older children. Children are not compared against arbitrary standards or the performance of their classmates. Parent teacher conferences are held twice a year to discuss student progress. Additional conferences can be held at a parent or teacher’s request. If requested, written summaries of conferences can be provided. Children with special physical or learning needs have access to many of supports through our school and area agencies that work in partnership with our school.